PEN centres call for all charges against lawyer and rights activist to be dropped. March 20, 2019 – PEN International joins Danish, Finnish, Norwegian and Swedish PEN centres in expressing deep concern for the well-being of Iranian human rights lawyer Nasrin Sotoudeh, who was handed over 38 years in prison and 148 lashes for national security-related offences. 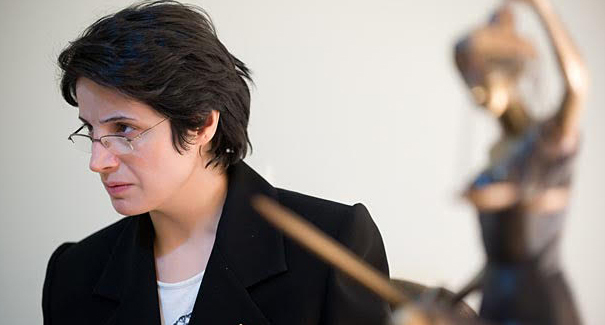 Sotoudeh, an award-winning human rights defender and an Honorary Member of PEN Canada and PEN Finland, is known for her role as a defender of rights of women detained for refusing mandatory covering of their hair in public. She was arrested in June 2018 for defending women prosecuted for appearing in public without a headscarf, or hijab. She was charged with spreading propaganda against the state, insulting the country’s supreme leader and spying. Lawyers such as Nasrin Sotoudeh are doing invaluable human rights work by representing suppressed voices in a time of veiled judicial crackdown on civil society in Iran. She is a symbol of civil courage to many around the world. A mother of two, she was previously arrested in 2010 and sentenced to 11 years of in prison 2011 on similar charges. She was released in 2013 after increasing international condemnation. Since the revolution of 1979, Iran’s powerful clergy establishment have remained in control of the state. Arrests, tortures and enforced disappearances of dissidents have become a pattern in Iran in recent years. The sentencing of Sotoudeh is a clear manifestation that Iranian judicial machinery, dominated by hardliners, has become an instrument of the ultra-conservative clergy that suppress dissident voices. PEN calls for the protection of Nasrin Sotoudeh’s right to freedom of expression. as enshrined in international charters and various global conventions.